Thank God, winter finally appears to have lost it’s grip on the cold weather as we’ve now had at least a week of warmer than normal temperatures and those snow banks are all but gone. The ground is a bit soggy, but I’ll take that over the snow banks and blowing snow any day. And with the coming warmer weather, our level of club activities is picking up markedly as you’ll see below. In fact, we’ve already had two impromptu star parties at the Heritage Center and quite a few more scheduled there for the coming months. Please Note!!! Our March meeting will be the 18th, e.g. the 3rd Thursday, rather than the usual 2nd Thursday of the month. Our featured speaker will be Dr. Larry Lebofsky from the University of Arizona and he will be talking on the topic of "Water on Asteroids." This event is financed by the gracious underwriting of Keith Minnich. Let’s see if we can fill the Museum’s auditorium for this program. On the agenda for March is another star party at the Heritage Center, scheduled on the 12th. Note: these early spring, or should I say late winter events, are being scheduled at the Heritage Center since we can set up on the solid macadam and we don’t have to contend with the possible soggy ground at the Flying Field. On the 19th, we’ll do a star party at the Pottstown School District, courtesy of Candi Simmons. The following night, the 20th, we’ll have our annual Messier Marathon up at Dave Brown’s farm. To round out the end of the month, please make sure you come and help at the Great Outdoor Expo at RACC. We’ll be showing sunspots, manning tables with astronomy games and various other club literature, and also present an astronomy talk. Lots of opportunities to help!!! The Expo runs from 12 noon to 5:00 PM. Beside the above activities, some of our club officers will be attending an Astronomy League sanctioned retreat. The three-day retreat at Greenbank, West Virginia is geared toward making us a better functioning club. Also during the month, various officers will be judging and presenting awards at the Reading-Berks Science and Engineering Fair held at Albright College. In case you’re not aware, BCAAS sponsors 6 awards annually. All of the above activities are in March, but April is also stacking up to be quite busy. On the 3rd, we’ll be sending delegates to the newly-forming PA Astronomy Co-op. The 8th is our regular monthly meeting (Planetarium Show) and the on the 9th, a star party at the Flying Field. At the end of April, on Sunday the 25th, the annual Earth Day Event will be held at City Park in Reading. This event will be much the same as at the Great Outdoor Expo mentioned earlier, except that Earth Day draws thousands of people, so we can use all the help we can muster for this event. Observationally, some of us have been doing the Pleiades Winter Observing project. This project wraps up at the end of March, but it’s a rather simple and easy exercise to complete, so if you haven’t done any yet, try some observations during March. Check out the web site for more details. Also, Jupiter and Saturn are in prime viewing position. 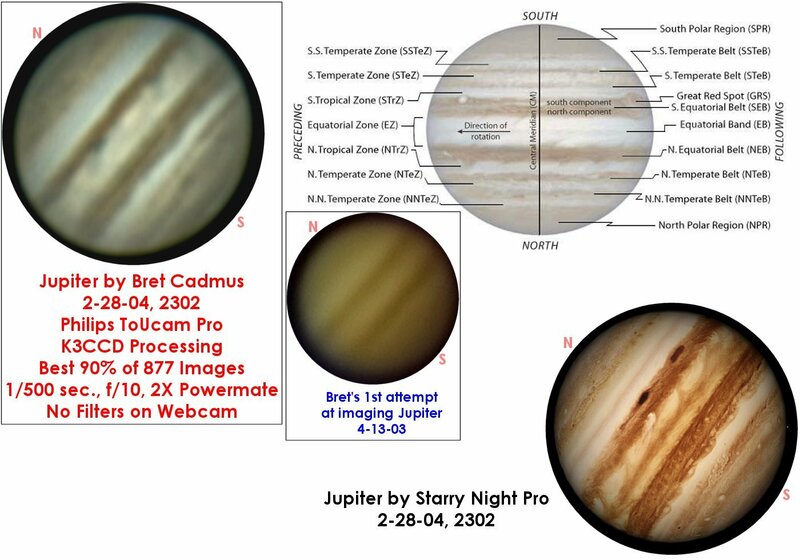 In fact on the evening of March 27th Jupiter will have three of its moons simultaneously transiting the surface of the planet. Even single transits are neat to watch and I’ve seen one double transit, but I’ve never seen a triple transit. I look forward to this event. And coming the middle of April and into May and June are two bright comets. So with all of the star parties listed, you’ll have some great targets to enjoy as weather turns warmer. Well, here’s clear skies to you and hoping we’ll see you at our upcoming events. Ron Kunkel, at rikunk@comcast.net or 610-488-6039, and Clear and Dark Skies to All. One of the most famous women of astronomy and one relative newcomer in her astronomical career was Carolyn Shoemaker. Wife of the well-respected and renowned scientist/astronomer Eugene Shoemaker, Carolyn has the distinction of being the world’s leading and most prolific comet discoverer. She holds the record for the most comet discoveries for a total of 32 (including 15 short period comets of the Jupiter family and 17 long period comets, two of which are giant comets that were difficult to discover as they got no closer to the sun than the outside of Jupiter’s orbit.) and also has found more than 800 asteroids, (of which 150 are numbered), including 33 Earth-approaching asteroids more than any other living astronomer. Carolyn married at 22 years old and spent the next 25 years as a "homemaker and mother" to her three children. Her late husband, Dr. Gene Shoemaker’s work led him to play a leading role in organizing geological activities for the lunar landings in the late 1960’s and early 1970’s, working as a chief scientist for the United States Geological Survey (USGS) Center of Astrogeology. Her husband always dreamed of going to the moon as an astronaut, however, the diagnosis of Addison’s disease prevented him from joining the astronaut-training program. Carolyn Shoemaker’s entry into astronomy was when she was looking for something fulfilling to do. "I asked my husband, Gene, who could and did spend most of his time working in geology and planetary science, for suggestions. It was he who though I might be interested in the telescopic search for near-Earth asteroids." And, so she joined him in his work. The work that Carolyn carried out involved the studying of photographic plates and films taken at 45 minutes to one-hour intervals of the night sky. This technique uses a stereomicroscope, which allows the researcher to view two plates or films simultaneously. (One eye looks at one film and the other looks at the second film; the brain will mesh or meld the images together. Any asteroids or comets appear to "float" above the flat surface of the stars). It is slow, methodical work, which does require training to discriminate between dust or grains of the film and near-Earth object. This is not a job that you hurry through. The x,y coordinates of the comet are measured, relative to their position to known stars, then you must record the times and lengths of film exposure. A good night’s work would last about 13 hours, adding the hours that she would scan the pairs of films afterward, her discovery rate is about 100 search hours per comet that she would find. As we can see, this is no easy task but one that takes much concentration, expertise and infinite love and patience for the project at hand. I didn’t know that Carolyn Shoemaker is a licensed pilot and received her pilot’s license in 1960 at the urging of her husband Gene. Among a few of the many awards which she has received was in 1988, the Rittenhouse Medal by the Rittenhouse Astronomical Society for the discovery of comets. Carolyn also became a "Cloos Scholar" at John Hopkins University in 1990. Her work in collaboration with her husband to investigate the meteorite craters and the ancient impact structures in Australia. She discovered the meteorites at Veevers crater and impactities at Wolfe Creek crater. Dr. Shoemaker received her bachelor’s and master’s degrees from Chico State College in California. She has an honorary doctorate of science from Northern Arizona University Flagstaff in 1990 for her work with comets and asteroids. At the present time, she continues her work as a research professor of photographic techniques for use with the Palomar Schmidt telescope that greatly facilitates the detection of fast-moving asteroids. Carolyn and Gene’s life together (personal and professional) ended tragically in 1997 on a field trip to Alice Springs Australia. They were involved in a car crash and Gene was killed instantly, Carolyn sustained severe injuries. She recovered and continues her observation work today with (co founder of the Comet Levy-Shoemaker 9) Dr. David Levy and his wife Wendee near Tucson, Arizona. Carolyn Shoemaker a truly remarkable member of the "Women of the Stars". And, one, which we all hope, continues with her groundbreaking work in astronomy. Please join us again in the Winter Star Watching Project – Pleiades, (M45 – also known as the Seven Sisters). The Japanese call this beautiful object: the Subaru. Several of our members are planning to participate in this project already and I am looking for more members to help out. The project is to assist the International Dark Sky Association (IDA) in Japan to determine the extent of light pollution around the world. When do we watch? During the months of February and March, the observing to start about one to one and a half hours after sunset. You will be observing the Pleiades and the Milky Way in (1) Perseus (2) Gemini (3) Monoceros. There is no limitation to how many may join in, how many may participate in any one location or how many such observations are held. No experience necessary and you do not need any special equipment, just a clear night and a small pair of binoculars. Total viewing time is about 10 minutes! Be sure that you dress warm – February and March are not known for warm nights. Observations are best done on a moonless night without fog or clouds or more than average amount of haze or smog. Also, you will need a good tolerance for cold weather and a good sense of humor. I will have forms available for your use and envelopes to mail forms back at the next several club meetings or you may down load a form from the Astronomy League’s web site at: www.Astroleague.org, and click on Astro Notes #8 – Winter Star Watching Project - Pleiades. Any questions please feel free to call: Michel Ramsey 610-926-3483 or e-mail: michelramsey711@hotmail.com. I ask that you mail your completed forms back to me as soon as you have completed your observations. The BCAAS has been keeping track of this information from all our observers before forwarding to the Astronomical League. We are participating in a valuable research project, by keeping track of light pollution over the next few years both in our area and its far-reaching effects in populated areas around the world. As astronomers we will be studying the loss of our dark skies for observing due to encroachment of population growth, outside lighting, shopping center lighting, highway lighting and etc. Also, for those of us who are more daring and would like to try some photography, Barry Shupp will be available to help us get set up. This is also a valuable tool for research study. By making a comparison of photographs taken over the years, scientists are able to note any expansion or the remission of light pollution in many areas. It is always a thrill when a bright comet appears in the night sky, and chasing comets is a favorite pastime of amateur astronomers. The comets tend to exist in a disk shaped belt, orbiting between 35 to 1000 astronomical units from the sun. The existence of this belt of comets was verified in the 1990's and is named the Kuiper Belt, after the man who predicted that millions of comets are orbiting there. Who was Kuiper? Gerard Peter Kuiper was born in Holland in 1905 and received his Ph.D. from The University of Leiden in 1933. He moved to the United States and became a U. S. citizen in 1937. He joined the staff of Yerkes observatory and became its director in 1947. He also served as director of the Mc Donald Observatory. He founded the Lunar and Planetary Laboratory at the University of Arizona in 1960 and served as its director. Kuiper focused most of his research on planetary astronomy and made many discoveries and predictions. In 1948 he correctly predicted that the atmosphere of Mars consisted mostly of carbon dioxide and that the polar ice caps contained water. His 1964 prediction that the surface of the moon would be like crunchy snow to walk on was verified by Neil Armstrong. Kuiper initiated the use of high flying aircraft to carry telescopes above the atmosphere so that infrared observations could be made. He died in 1973 while serving as director of the Lunar and Planetary Laboratory. In 1974 The Kuiper Airborne Observatory was named in his Honor. Also, craters on the Moon, Mars, and Mercury have been named after him. Dr. Larry Lebofsky is a Senior Research Scientist in the Lunar and Planetary Laboratory and Steward Observatory at the University of Arizona (UA). While he continues to be involved in astronomical research, he has been dedicated to education at all levels for more than a decade. At the college level, he teaches General Education astronomy and planetary sciences courses for non-science majors, co-teaches two science education classes for future K-8 teachers, and co-directs an intervention and retention program for large General Education Science classes. He and his wife Nancy have been conducting pre-college teacher workshops since 1990. He is the Director of the UA/NASA Educator Resource Center, the Education and Public Outreach Officer of the Division for Planetary Sciences (DPS) of the American Astronomical Society, and is the President of the Arizona Science Teachers Association. In recognition of his dedication to education, he was the 2000 recipient of the Carl Sagan Medal for Excellence in Public Communication in Planetary Science awarded by the DPS. He received his BS in Astronomy from Caltech in 1969 and his PhD in Planetary Sciences from MIT in 1974. Besides his more than 60 research papers he has also coauthored science education articles, a book chapter in an elementary science education book, and an astronomy book for parents and teachers. "Oh, the fun in not reading instructions and hoping to stumble across the correct settings (and then not writing them down for future use)." The Astronomical Society of Harrisburg will host a meeting of Pennsylvania Astronomy Clubs from across the state on April 3, 2004 at 1:00 PM at the Naylor Astronomical Center. The purpose of this meeting is to discuss organizing a statewide astronomy club cooperative. Each astronomy club in the state is invited to attend and send 2 delegates to the meeting. Our delegates will be Ron Kunkel and one other board member, either Ryan Hannahoe or Mike Bashore. Let’s find out what this promising union has to offer PA astronomy clubs! BRIDGE TO CLOSE - FOR A LONG TIME! Many of you come to our meetings at the Museum via Park Road, passing over the railroad bridge at Vanity Fair. Well, by the time you receive this newsletter, this bridge will be closed for repairs. The entire structure of the bridge is going to be worked on, so the bridge will be closed for an estimation of 8 months! However, you can get around using the bridge. If you come down the bypass, you can get off at the West Reading exit instead and come straight up Penn Avenue to 5th, turn left, and the road will become Museum Road. If you take the North Wyomissing Blvd exit, at the traffic light at Park Road, go straight ahead. Keep following it to the next traffic light (across the street from the Granite Point building which you will see high on a hill), and turn left. This is State Hill Road. Follow it to the next light and turn left. You are now on Penn Avenue heading toward Park Road. Turn right at Heck Brothers Florist and you are back to where you would have been had you used the bridge. If you turn left at the traffic light onto Park Road out of habit, don’t worry. The streets in Berkshire Heights do strange things. Turn left at Friendly Ice Cream, go up the hill, and turn left at the top where you see the church. You are now back on track again on your way to the State Hill Road. If we’re going to use the Earth as a viewing platform for our star gazing, we ought to learn a little about how this planet we live on and our eyes affects our celestial viewing. First, the obvious: Usually our best viewing is done at night, because that’s when we can see the stars. It’s not that the star light doesn’t reach us during the daytime, but rather that the more intense light from the sun overwhelms the receptors in our eyes and we see only the illumination from the sun. Our sun, by the way, is actually white; not the yellow that we see. If we were out in space, we would see it as a white star. We see our sun as a yellow star because of the Earth’s atmosphere and how the color receptor cones in our eyes work. The Earth’s atmosphere diffuses, or scatters, much of the blue light from the white sunlight before it reaches our eyes, causing our yellow light receptors to be on stronger than the blue receptors and thus we see yellow instead of white. The blue light stays in the atmosphere and gets reflected around until it eventually reaches our eyes, and that is what makes the sky appear blue and helps hide the stars during the daytime. When the sun is away from us, on the other side of the earth, all that extra blue light is not there and we see the stars as if looking through a window. So, if all that blue light is gone at night, and the stars are red, green and yellow, as well as blue and white, why do most of the stars still look blue? Again, it is because of how our eyes work. We have black and white rods, as well as the color cones in our eyes. Most of the light we see from the stars is not strong enough to activate our red and yellow color cones, but does activate our black and white rods, so we see the stars as white from the rods. Our blue color cones are more sensitive than our red and yellow cones, so we see mostly blues and whites. Stars are not 100% red or 100% blue, etcetera. They radiate other colors in smaller intensities along with their predominate color. A yellow star will radiate some blue along with its yellow, and if the yellow light does not activate our yellow color cones, we will most likely see a blue-white star. So, how do we see the true color? Your telescope can help. The light gathering capabilities of your telescope can intensify the light from stars and help show the colors. The bigger and better the lens or mirror, the better it is at gathering and intensifying the light from the stars, and the better you will be able to see the true colors of the stars. In the days before radio time signals, navigators on ships in harbors needed to check the chronometers that were used for celestial navigation. The harbor master had a very accurate chronometer that was set from one that was carried from harbor to harbor by an agent from the Navel Observatory. The time was transferred to ships in the harbor through the use of a large black ball on a tall pole. The ball would be raised to the top of the pole at about five minutes before noon. This was the signal for the navigators to get ready. At one minute before noon the ball would be lowered several feet so that it was obvious that the countdown had started. Every five seconds the ball would be lowered some more until it was just above an enclosure. At exactly noon, the ball was abruptly dropped out of sight into the enclosure. Keeping accurate time in those days of mechanical clocks and no time signals was a complicated matter. The ship's clock was kept in a well protected place in a gimbaled box and was seldom disturbed or reset. It was wound the same amount at the same time each day. A log was kept of its rate of error. A portable clock, called a hack watch, was carried on deck for celestial sight taking. How accurate did the clock have to be? Celestial navigation is done by measuring the height of a celestial body above the horizon. The precise location of the body is gotten from a nautical almanac for the exact time that the height is measured, usually through the use of a sextant. The earth rotates 15 degrees per hour, which is .25 minutes of arc per second. The worst case would be for a sight taken due east or west on the equator. A four second time error would cause one minute of arc error. A nautical mile (6076 Feet) is one minute of arc on the surface of the earth, so the time error alone would cause a nautical mile of error. A sight taken on Polaris from our latitude would be very insensitive to clock error. Celestial navigation is a difficult art, and position errors of as much as 10 nautical miles were common as late as World War Two. It hasn't gotten much better since then. Modern navigators can reliably get a position that is accurate to within about one nautical mile under ideal conditions. Conditions seldom are ideal! The advent of the GPS Positioning System has rendered celestial navigation obsolete. - Fun for all ages! - Bring a scope, bring a friend—see you there! - Thousands of people make a great public outreach event! Sunday, April 4th - Daylight Savings begins—time to "spring forward"! Thursday, April 8th @ 7:30pm - BCAAS meeting in the Planetarium!! it’s gonna be a great observational opportunity!